1) It looks like there will be a plethora of new pizza choices (well, at least two new ones) in Williamsburg soon. We've previously noted the impending coming of La Nonna at 237 Bedford. The always watchful Will Femia takes note of yet another place on his Test of Will blog, the Fratelli Brick Pizza Joint at 159 Grand. Of course, you've also go the Brick Oven Gallery on Havemeyer, Fornino on Bedford, some good pizzas coming out of the oven at Baci & Abbracci on Grand and others. 2) The spot on N. 12th Street across from McCarren Park that was a very short lived Amazon Cafe and then was supposed to be Patisserie Lafayette now sports a chalkboard saying that it will have sushi and Japanese cuisine. A restaurant storefront of death in the making? 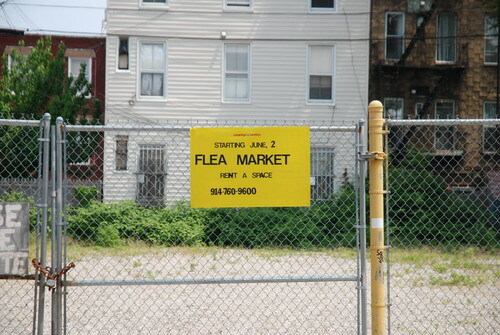 3) If the signage is correct, a new flea market on N. 6th Street will be opening this weekend (Saturday, June 2, to be exact). It's on an empty lot between Wythe and Kent sort of across the street from Galapagos. Of course, you've already got the ersatz flea market every weekend on the sidewalks on Bedford. 4) We haven't ventured down there yet, but New York Magazine notes that the new Greenpoint outpost of the Brooklyn Ice Cream Factory on Commercial Street is open. Now, the opportunity to get some of that ice cream without waiting on the insanely long lines at the waterfront branch is something about which to be happy.